Wash and trim the ends of the cucumber. Peel it lengthwise with a vegetable peeler, keeping 1 out of every other ribbon. 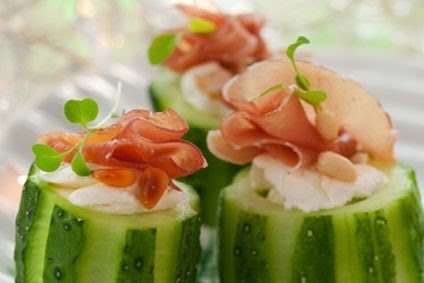 Slice the cucumber into 8 sections and using a teaspoon, remove the flesh, forming a “cup” with ½ cm-thick borders. Drain crab meat and flake it using a fork. Combine crab meat, sour cream, herbs, chives and a few drops of lemon flavoring. Season to taste with Salt and pepper. Stuff cucumber cups with crab meat mixture, put them on a plate, sprinkle with the rest of the chopped chives and sliced crab sticks. Decorate with whole crab sticks and asparagus spears.